UPDATE: Despite the valiant efforts of activists and organizations, on July 6, 2017, the W3C greenlighted DRM for the Web. This is all the more reason to stop giving Netflix your money! Read more here about Encrypted Media Extensions (EME) and how it harms users. Netflix just announced that they are streaming videos in HTML5, only in browsers with "Premium Video Extensions". You know what that means -- Digital Restrictions Management (DRM). The announcement is Netflix's latest chess move in their long game to blanket the web in DRM. Slipping a DRM delivery mechanism into the HTML5 standard is the online streaming giant's endgame. If the outrageous proposal Netflix is peddling to the World Wide Web Consortium (W3C) is adopted, you can kiss the free Web as we know it goodbye. Where do they get the money to gain influence at W3C? 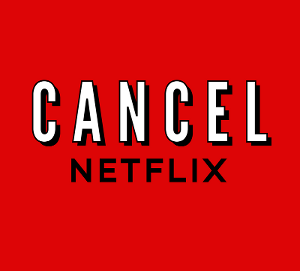 Use the hashtag #CancelNetflix to tell @Netflix why you're leaving. The proposal has faced massive public opposition, and so Netflix is introducing a new strategy. Fake it til you make it. In yesterday's announcement, Netflix rep (and W3C proposal engineer) Mark Watson said: "We expect premium video on the web to continue to shift away from using proprietary plugin technologies to using these new Premium Video Extensions." That's some impressive doublespeak: Premium Video Extensions are proprietary. Meanwhile, in the real world, at least one W3C member has spoken out in opposition to the proposal, and an international coalition of 27 organizations along with tens of thousands of individuals have also asked W3C to abandon the proposal. But so far Netflix, and other powerful W3C members like Microsoft and Google, are drowning out that substantial opposition with brute force. That's why now it's time to vote with your dollars. While W3C CEO Jeff Jaffe's public support for the proposal is baffling, it's the proposal's authors, led by Watson, who developed this scheme. DRM has been an important part of Netflix's business model from the beginning; the company currently uses Microsoft's proprietary plug in Silverlight to lock down its streaming videos. For Netflix, which has previously had to spend time and money to implement DRM, getting W3C to include support for DRM in the HTML standard would make it easier and cheaper for them to control your online viewing. Netflix, and other companies supporting the proposal, have resorted to thinly veiled threats to deprive the world of movies. Having flashbacks to the empty threats made during the SOPA/PIPA fight? Yeah, us too. While it didn't work on Congress, the threat seems to be working on the W3C. In a recent blog post, Jaffe wrote: "Without content protection, owners of premium video content - driven by both their economic goals and their responsibilities to others - will simply deprive the Open Web of key content. Therefore, while the actual DRM schemes are clearly not open, the Open Web must accommodate them as best possible." We prefer the term 'free Web' Jeff, but we hear what you're saying--Hollywood is a bully and if you don't give them your lunch money, you'll end up with a wedgie. The bullying may be influencing the W3C, but it won't work on us. We want Netflix to know we won't let them pervert W3C's mission just so they can save a few bucks. If Netflix wants to continue restricting users with DRM, they can do it on their own dime. So let's show Netflix that pushing for DRM in HTML won't save them anything; in fact, it'll cost 'em. Cancel your subscription to Netflix, and tell them why. And once you've canceled, how about donating those subscription funds to a group that is fighting on your behalf, like the Free Software Foundation or the Electronic Frontier Foundation? We will use those dollars to amplify the impact of your cancellation.